Jack Harvey was fastest as the British Formula 3 International Series field completed two sessions of testing before this weekend's final round at Donington Park. The track gradually dried out during the 45-minute morning session, and Lincolnshire racer Harvey, who sits six points behind championship leader Jazeman Jaafar, beat his Malaysian fellow Carlin Dallara-Volkswagen runner by just under a tenth of a second. Felix Serralles, the third of the main title contenders - he is three points behind Jaafar and three ahead of Harvey – was a further two tenths adrift in third place in his Fortec Motorsport Dallara-Mercedes. Serralles was the quickest early on in the afternoon session, improving his morning time by a tenth, before team-mate Pipo Derani crashed and caused a lengthy delay while a tyre wall was rebuilt. During this time it rained, so there were no further improvements. 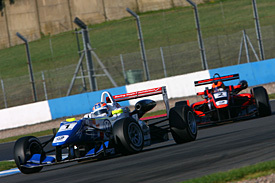 Pietro Fantin showed improved form to go fourth in his Carlin car, ahead of Fortec runners Alex Lynn and Derani. During the final 20 minutes of running on a wet track, rain expert Hannes van Asseldonk was fastest in his Fortec Dallara, just ahead of Lynn – albeit 13 seconds off the dry-weather pace. Returning F3 veteran Hywel Lloyd lost some running in the first session with a mechanical problem on his CF Racing Dallara, but in the afternoon he pumped in a time good enough to pip National Class points leader Spike Goddard. Welshman Lloyd also ran consistently among the fastest six overall when the track was wet.